I remember my very first MAC lipstick, purchased when I was about 13/14? It was the ever so wearable Lovelorn, one that I went through tubes of and used it until the age of 18. Yes, thats 4 consecutive years! Colours like saint germain, lavender whip and hue wasn't good enough for me so they were sold. All swatched in natural daylight. 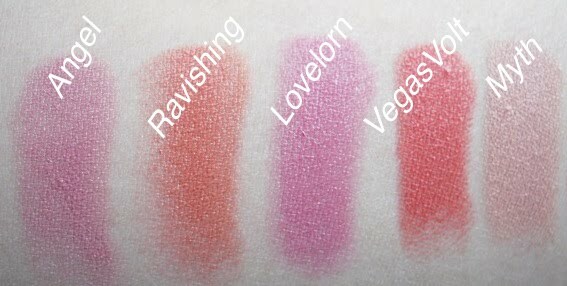 My Fave is Ravishing which surprise surprise is a cremesheen formula, its very wearable, its a creamy coral/orange colour. Apart for Lovelorn and Ravishing, I never finish any of the other colours. I haven't been impressed lately by the colour selection in the latest MAC collections, all seem pretty similar to something I already have. Whats your fave MAC colours? You might like plink :-) Its a cross between a pink and a coral. The Cremesheens look great but i have the same problem that they dry out my lips -.- it doesnt matter if i use a lip butter under it. But i still love Hue! It´s my everyday lipstick. it´s a color which you can wear everytime. oh the morange looks very pretty for summer! My favorite MAC lip colors are Ladybug and Russian Red. OMG you are so gorgeous!! What do you think about Vegas volt?